I grew up in North American suburbs. Although as an adult I’ve lived mostly in cities, ultimately, I came back to the ‘burbs. The redeeming qualities of suburbs are few, and, like cities, socioeconomic equality is not among them. In the US in particular, suburbs are emblematic of the racism at the heart of the nation’s character. But, in their sprawl and ‘quaint’ neighborhoods, I’ve always found ‘scope for the imagination’. At night in the city, I am anonymous; at night in the suburbs, I feel alone. I’ve always wondered where my neighbors – whom I’ve never known – are. Whereas for urbanites the city is their living room, I guess most suburbanites like their homes – a lot. And that’s the tip of a phenomenon: without equivocation, in the suburbs, we are keenly aware of each others’ surface lives (comings and goings, new driveway, new baby, the strange language of stickers on the backs of SUVs) and totally disconnected from the substance below. It’s this paranoid reading of appearances that drives (there goes the neighborhood…): at what point does watchfulness turn into surveillance? I am, I think, one of maybe four Black people/families that live in my gated community. Here, there are grassy knolls where people can run or walk themselves and their dogs. Each knoll slopes down into our back gates and decks, so, stop long enough – to ‘chat’ or watch the dog poop – and see right into the neighbors’ homes. I feel particularly ‘glanced’ at because I’m Black. Hyper-visible. For one month on even days from 7:30P to 8:00P (prime dog walking time), I gave my neighbors something to look at. 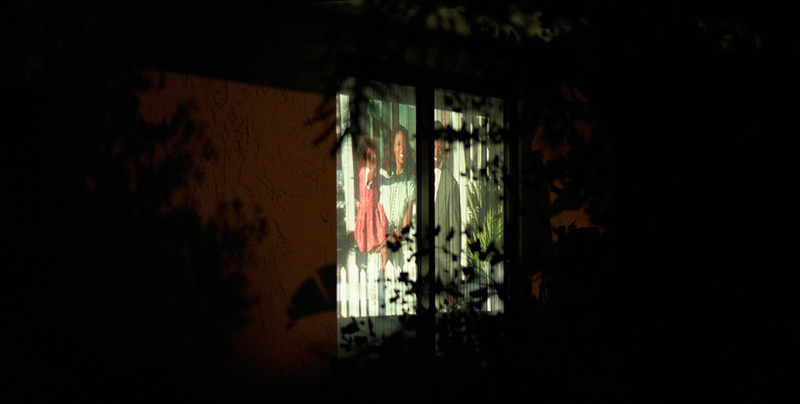 (there goes the neighborhood…) is a site-specific single-channel video installation. 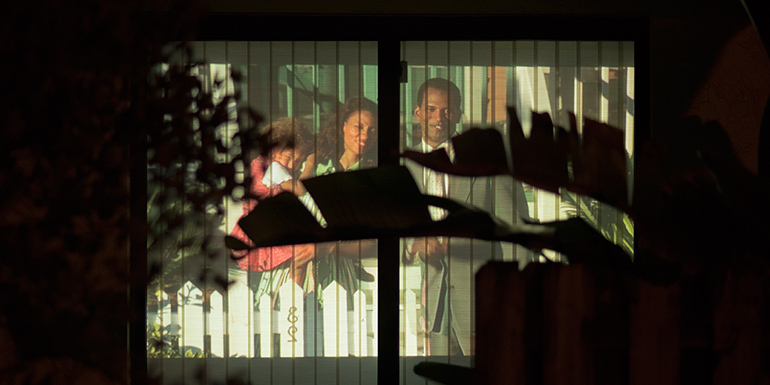 Through translucent vertical blinds, I project a looped scene from a mainstream film about voyeurism images of an idyllic Black family waving at their neighbor. These ‘screenings’ are my protest, a response to the bass note of dread that accompanies my every act in my neighborhood.